The Instant Pot Ultra is one of the most popular multi-use cookers on Amazon for so many good reasons. 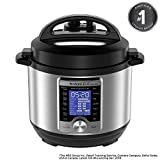 That’s why it’s such great news that one of Amazon’s deals of the day on Wednesday covers the Instant Pot Ultra 3 Qt 10-in-1 Multi- Use Programmable Pressure Cooker. This model has it all, and it’s perfect if you’re making sides or even a meal for two people. If you’re cooking for four or five people, however, you’re going to want something bigger — but don’t worry because we’ve got you covered there, too. 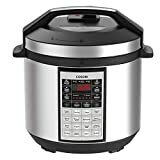 In addition to its sale on the Instant Pot, Amazon is also running a sale on the COSORI 6 Quart 8-in-1 Multi-Functional Programmable Pressure Cooker… and it’s actually just over $8 less expensive than the Instant Pot model that’s half its size!